She’s possibly the only singer who can claim to have gotten her big break working for McDonald’s, but that’s just what happened to Sheryl Crow, who landed her first major singing spot on a jingle for the fast food giant in the 1980s. Sheryl quickly capitalized on the success, becoming a back up singer for Michael Jackson, Sting and Stevie Wonder, to name a few. Since then it’s Sheryl who’s stolen the limelight. She’s racked up nine Grammy Awards and sold more than 50 million albums worldwide. Dial forward a decade and a half and Sheryl is still making waves with her music. She’s just released 100 Miles from Memphis, and has even found time to take up charity work, campaigning against crimes against humanity for the Enough Project. 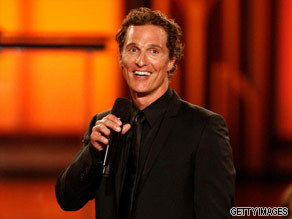 Known for his all American good looks and stellar sense of humor, Matthew McConaughey has transformed himself into one of the most popular actors in Hollywood. Matthew McConaughey is your Connector of the Day. Born in 1969, McConaughey first came to fame on the silver screen for his role in the blockbuster 1993 hit "Dazed and Confused." McConaughey went on to star in such romantic comedies as "How to Lose a Guy in 10 Days," "Failure to Launch," and "Fool's Gold." Now McConaughey is teaming up with the Samsung Hope for the Children organization to help inner-city school children at L.A. schools. Along with Samsung’s retail partner Best Buy, they support the j.k livin foundation, a non-profit organization the actor started in 2009 to serve youth in communities across the U.S.
By partnering with Communities in Schools (CIS), the nation’s largest non-profit dropout prevention organization, the j.k livin foundation provides free fitness and wellness after-school programs that offer teens a safe place to learn and improve responsibility, self-esteem, accountability and commitment. Through the CIS program, 98% of all tracked students stayed in school. To help fund these critical after-school programs, Samsung today announced a $300,000 donation to the j.k livin foundation.